The most perfectly planned travel can be ruined by an unanticipated illness or injury. Obsessive as I am I found it absolutely essential to check out all possible health precautions so I would not "check out" on my jungle trip. From a health perspective, a seven day journey up the Amazon River into the jungle, even on a "luxury" river boat, is nothing like the luxury cruises in the Mediterranean or Caribbean, that I was accustomed to. The rain forest environment is hot and humid, and vicious little mosquitoes carry nasty organisms that cause malaria, yellow fever, dengue fever and other diseases. The first jarring reminder of the isolation and primitive nature of the area into which we will be traveling, came from the disclaimers and advice in the information package from the booking travel agent. Then after I did some serious reading I decided to speak with a medical travel expert who would be current on what precautions would be needed to keep us fit and healthy. I went to consult a doctor at a Travel Clinic. The first facts she needed to lay out a prevention plan were the exact dates and duration of travel, and the precise locations that I would be visiting at a given time. Since the Amazon River cruise was going to be preceded by time in Lima, Peru and followed by travel to Argentina, Brazil and then to South Africa, my itinerary was more complicated than just the cruise on the Amazon River. Here is the broad outline of the management plan and timing for immunizations and other preventative measures for my trip. Your preventative health plan may differ depending on the specifics of your travel. Basically I considered the preventative measures in two broad categories. In regards to immunizations and vaccines, under general prevention, consider the need to keep immunizations up to date for Diphtheria, Tetanus, Pertussis (DTP) and Polio, Hepatitis A and B and Influenza. As several of my friends had recently experienced shingles (a flare-up related to varicella (chicken pox) in childhood, I decided to get the shingles vaccine too. For a physical protection against being bitten I also took with me a long sleeve version of the cotton shirt I'm wearing in the picture above, to be worn from dusk on when the mosquitos become active. To spray my surroundings and exposed parts of my body I bought CedarCide spray, made from cedar oil. Then there were the immunizations specific to this South America trip: The main infectious hazards are of two kinds, enteric diseases that are spread by contaminated food and water (typhoid, cholera, and other causes of traveler's diarrhea) or those spread by insect vectors like mosquitos - malaria, yellow fever, dengue fever). Two red flags for this journey into the jungle are that it is an area where Yellow Fever and Malaria are endemic. 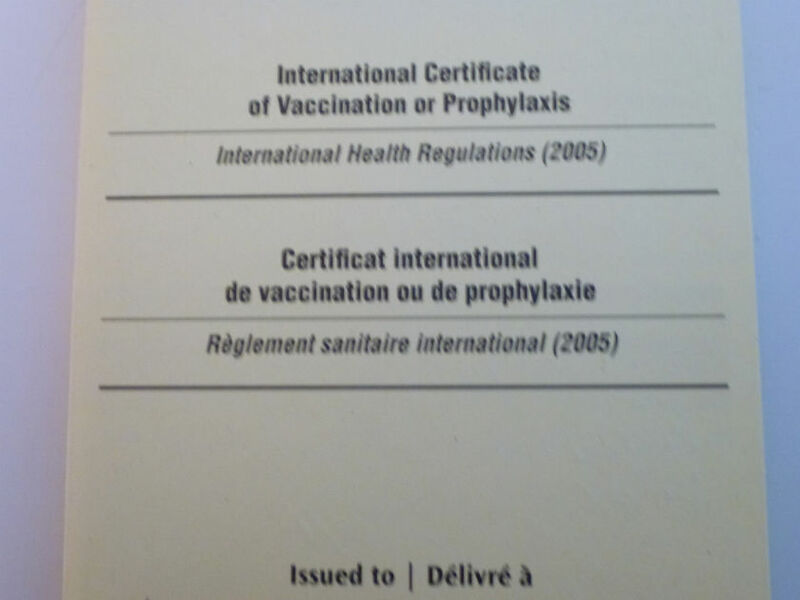 In fact after having been in a yellow fever endemic area, in order to enter Brazil, I had to have an International Certificate of Vaccination or Prophylaxis against Yellow Fever. My immunization protocol: I immediately had three injections, one for Yellow Fever (good for 10 years), a booster shot for Tetanus, diphtheria, attenuated Pertussis and Polio, and the first of three shots for Hepatitis B. The second Hep B shot is done a month later and the third in 6 months after that. As well as the injectable immunizations, there were three oral preparations recommended. Vivotif (typhoid vaccine) which could be taken immediately, Dukoral for Traveler's diarrhea - to be taken one week before leaving on trip (it is effective for only 3 months), and Malorone, an anti-malarial. Although there are other options for malaria prevention, I opted for Malarone: This is an oral medication taken as one tablet one day before entering endemic area, one tablet daily while in the endemic area, and continued for a week after leaving the area. I needed to take that with me and remember to use it.